John Davidson casts his eyes over Super League’s round 18, which saw Castleford pip Leeds at a thriller at Headingley and Saints go top with a tough graft over Wigan. Castleford were the revelation of the 2014 season – unpredictable, attacking, simply thrilling to watch. Everyone loves an underdog and this underestimated Tigers side went all the way to a Challenge Cup final and were mere inches away from the League Leader’s Shield. But success brings attraction and Castleford’s dynamic 2014 squad was gutted by rival clubs. Daryl Cark went to Warrington, Craig Huby and Jamie Ellis to Huddersfield, Marc Sneyd to Hull FC and Weller Hauraki to Salford, among others. The departures hurt and Daryl Powell had some serious rebuilding to do. In came Luke Gale, Scott Moore, Denny Solomona, as well as Ben Roberts and Junior Moors from the NRL. It would be a big ask to replicate the feats of last year and would take some time for the new players to gel. But slowly, slowly it is happening. The Tigers have 10 wins from 18 games and are starting to build some momentum. The impressive victory over the Rhinos on Thursday means they are now just six points off first-placed St Helens. That win showed tremendous guts and an ability to grind out a result. They’ve also done all this without the services of Luke Dorn and Justin Carney for most of the season, as they battle injury, and both Aussies played key roles last season in the team’s attacking output. Cas have hit form and have a huge test this week in the form of the visit of Saints. Credit has to go to Powell who is working wonders on a small budget again. The Tigers have demonstrated enough this year, just like last year, that it’s dangerous to write them off. He’s played less than 20 Super League games but Andre Savelio has already shown what a find he is. The monster ripped in against Wigan on Friday, showing no fear and a real love of the tough stuff in the middle. He only turned 20 in March but Savelio is 6ft 2inch and 110 kilograms and doesn’t shirk hard work. He’s not all hard graft either – the big man has soft hands and a penchant for the Adam Cuthbertson-stye offload. St Helens have got a great young player on their hands. Saints might have the best forward pack in the competition, with big boppers like Mose Masoe and Alex Walmsley, but Savelio is forcing his way into Kieron Cunningham’s calculations. He comes from good rugby league stock too, the son of former Salford, Widnes, Halifax and Workington prop Lokeni Savelio. With his New Zealand and Samoan bloodlines, Savelio is eligible to represent three countries at senior level. He also has an ambition to crack the NRL one day and we could be seeing now the beginnings of something special. Hurt and disappointment for the Black and Whites in Perpignan on Saturday. They battled and troubled Catalans at times but just couldn’t take their chances, falling to the Dragons in the end by six points. The decision late to not award a try to Fetuli Talanoa, which could have tied the game up with a successful conversion at 20-20, was a heart-breaker. On first glance the try looked fine when Talanoa touched down in the right corner. But on closer inspection it showed Setaimata Sa blocking Ben Pomeroy as he ran a decoy line to put Talanoa into space. Sa hit Pomeroy with his dummy run, leaving the referee no choice but to not award the try. But there’s little doubt that Pomeroy milked the contact, ala Cristiano Ronaldo, to ensure the referee took notice. Pomeroy was impeded but dived to the ground to exaggerate the hit. Diving is something that is slowly creeping into the game and it’s very sad to see. The obstruction rule remains a contentious one and every match seems to throw more questions, with the amount of second-man plays that teams now use. Had Sa altered his run by a metre or less than Talanoa would have had a try. But I believe more emphasis has to be put on the defender to make the right read in defence, not to flop or dive once the wrong choice and minimal contact has been made. The referee was put in an unenviable position on the weekend and the situation is sure to crop up again and again as the season rolls on. Who are the big names we might see in Super League next year, after the approval of the marquee player rule? Not all the clubs wanted it, but finally it has been given the green light at the third time of asking with a 8-4 vote. The marquee concept remains controversial and could lead to a greater disparity between the richer and poorer clubs. There’s also questions about just who qualifies a marquee player. Is it a Sam Tomkins, or a Sam Burgess? Or someone like Greg Inglis or Billy Slater? Would an approach for the likes of All Black and NRL grand final winner Sonny Bill Williams be feasible and worthwhile? Or is it more about keeping the likes of Zak Hardaker in Super League who might fancy a shot at the NRL or rugby union? All good fodder for the media and fans to speculate on. But rugby league is a team game and clubs need to be very careful that the player they sign as a marquee can adapt into an established team and a playing system, as well as fitting well into the club’s culture. Salford has shown what can happen, and not happen, when you fill a team with stars with little foresight or planning. Super League sides need to be wary of a one-season signing who is long in the tooth and is after one more big pay cheque before hanging up the boots. For example, I don’t think Paul Gallen would be a good choice. But there are others who can fulfill all of the crucial criteria of bringing in more bums on seats, attracting new sponsors and improving a team on the field. Inglis, at 28 years of age, would certainly do that, as would the 27-year old Jarryd Hayne if his NFL adventure doesn’t work. Very few players can do all three though and have that proper marquee affect. You can see how the marquee system has had varied success in other sports in other countries, like Major League Soccer in America and the A-League in Australia. Let’s hope the Super League clubs invest their cash very wisely. Hate’s a big part of rugby league and passions often spill over in games. It’s inevitable sometimes in a such a physical sport. The Hull derby, Wigan vs St Helens, Cas vs Leeds, State of Origin, there’s some fiery games out there. Hatred and passion are sone of things that at times makes rugby league great. But Huddersfield and Warrington? Really? Anyone who went to the John Smith’s Stadium to see the Giants take on the Wolves on Sunday was treated to a lot of mistakes in the first half and scuffle after scuffle in a spiteful second half. 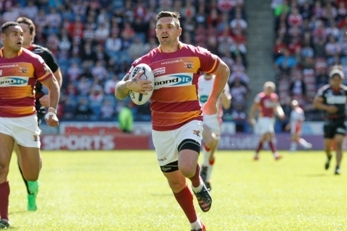 Four yellow cards were dished out in total, to Huddersfield pair Danny Brough and Jake Connor, and to Warrington’s Anthony England and Daryl Clark. They all came in an action packed final 40 minutes and there could have been a few more. The bad blood between the two sides was really on show, but why? The two aren’t traditional rivals, nor do they have any specific negative history, though both are in the battle for the top five this season. Ex-Giants coach Tony Smith couldn’t explain it. The first flare up came three minutes into the second half after Jodie Broughton scored. Brough and England were in the middle of it, as all the players raced in, and the two were then sent to the bin. Perhaps the most amusing sight was the square-up between the halfback and the prop. England was keen to continue it after the referee intervened, and he had to be restrained by a trainer as Brough continued to chirp away as both left the field. Brough stood his ground even though the Wolves forward had a good 20cm and 34 kg on him. Talk about a featherweight taking on a heavyweight. The clash had shades of Queensland’s Wally Lewis and NSW’s Mark Geyer famously butting heads in Origin in 1991. Ah, memories.